A companion to the hugely successful Planet Golf, this gorgeous book features photographs and detailed reviews of more than 140 of America's finest golf courses, making it the most comprehensive directory ever published on the nation's outstanding layouts. Included are reviews of every Top 100 ranked course in the United States, according to Golf Digest and GOLF Magazine, including Augusta National, Cypress Point, Pine Valley, Shinnecock Hills, Pebble Beach, Whistling Straits, Oakmont, National Golf Links of America, Winged Foot, Pacific Dunes, Bandon Dunes, Oakland Hills, Medinah and many more. Author Darius Oliver, a regular contributor to golf rating panels, visited every course that he reviews in this book and provides readers with a detailed ratings section that outlines the best, hardest, and most dramatic golf courses and golf holes in the country, as well as a unique Planet Golf World 100 ranking that selects the 100 finest courses on the planet. 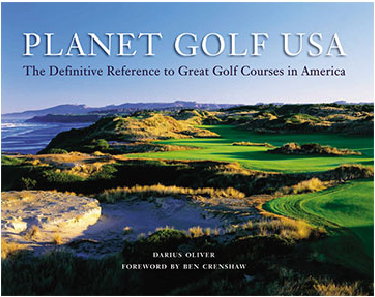 **Exclusive offer - Australian users can purchase copies of Planet Golf USA directly from author Darius Oliver for only AUD $40.00 incl P&H. (RRP $75.00). PLANET GOLF USA works perfectly on every level. One of golf design's most astute critics, Australian Darius Oliver, has carved out a superb sequel to his original compendium of the world's best courses. What separates-and elevates-this book from other coffee table tomes is the author's insights and candor. Oliver doesn't pull punches, even tweaking the Top 100s where he sees fit, including our own at GOLF Magazine. Agree or disagree, you'll find yourself totally engaged. Planet Golf and Planet Golf USA are some of the greatest catch-all volumes of golf courses I have ever seen.